Here’s our latest Tesla related humor…. Wanna know why I bought the Cimarron and not the Model S? Easter eggs are hidden fun items that Tesla programmers have added over the years. With the May-2017 8.1 releases, you can quickly access some of these Easter eggs by tap the “T” in the center top of the main screen and in the dialog top center (where lines appear) drag downward. You can still access items the old ways too! Team members (except 8.0; 8.1 ok) – Press the “T” at the top center main display, then press and hold the model signifier graphic for 15 seconds. The display changes to show Tesla team members back in 2012. As of 8.0 you get a slight flicker after 15 seconds, but nothing else occurs. Works again in 8.1+. Multicolor Charge Port – With the charger connected and a white ring (not charging, unlocked), on the handle, press the port release button 10 times in a row. The port goes multicolor for about 10 seconds and then locks the handle. You have to manually start charging and stop it, then the release works normally. Ludicrous Mode Warp Speed – Switch from Sport to Ludicrous mode and hold the Ludicrous button for about 5 seconds – the screen will go into warp speed! Ludicrous Plus – gains about 35 hp and boosts 0-60 to under 2.4 seconds on a Model S! To activate, you need 2.52..22 or later on a Ludicrous equipped P100D vehicle. 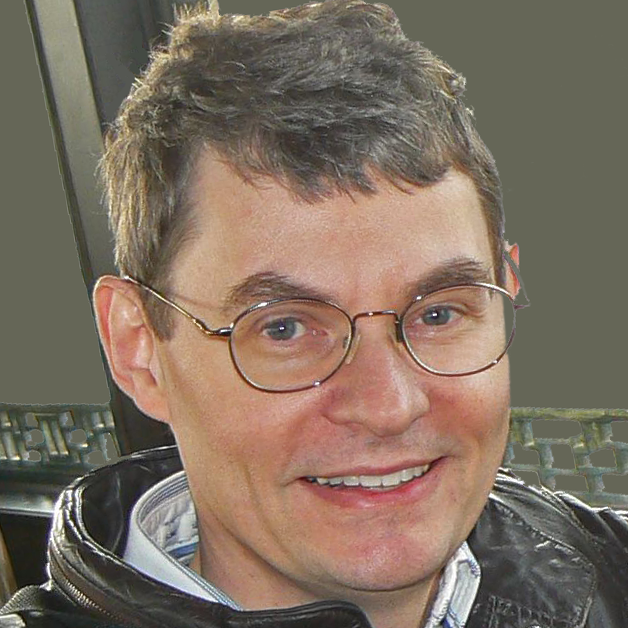 Switch from Sport to Ludicrous mode and hold the Ludicrous button for about 5 seconds – the screen will go into warp speed and a new dialog appears “Are you sure you want to push the limits?”. Select “Yes, bring it on!”. Wait for battery heat, and activate Launch mode. As a bonus, the right side power meter adds a magenta arc for battery temperature. On the left, a new scroll-wheel selection is available “Readouts”. It shows the instantaneous and max values for battery power, each motor’s power and the longitudinal acceleration. Driving Rainbows – For autopilot equipped vehicles, and when autopilot allowed, pull the autopilot engage lever quickly 4 times in a row. The instrument panel will show a cool rainbow graphic as you drive and you may hear the audio from a SNL skit by Christopher Walken “I Got a Fever…” if nothing is playing. Drawing App – Tap the “T” at the top center three times quickly. A touch drawing app appears. You can change the pen size, colors and more. Draw away! On version 9, Press and hold the phone button (not the one for music, but the old-time phone button to make a call). The words “ahoy-hoy” appear under the phone. This was Alexander Graham Bell’s preferred salutation when answering the phone. It is derived from the nautical “ahoy”. Thanks go to jordanrichard for reporting this one. Farts – tap the fart icon and select your fart style and on demand or with the turn signals (v9, 2918.48.12). Fireplace – Enjoy the warmth of your own fire in the main display (v9, 2918.48.12). For each of these, Press and hold the “T” at the top center main display for about 8 seconds until the logo flickers. 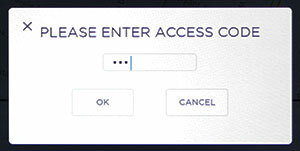 At the access code screen, enter the text to activate each easter egg. Enter “007” for cars with air suspension. 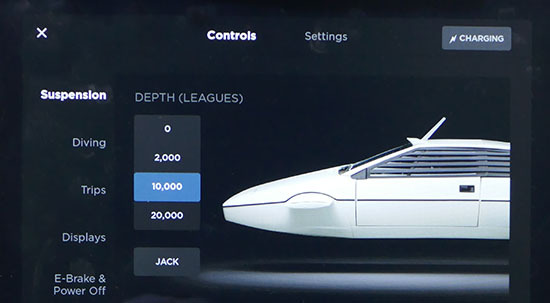 Go to Controls, Suspension and the Model S is replaced with the 007 Lotus Esprit submarine from the James Bond movie “The Spy Who Loved Me”. Heights are in fathoms! To restore normal graphics, repeat the process. Enter “performance”. On some high-end models you will get the choice to reduce performance to simulate other versions of the car. This only works in some versions like the 90D and was intended for sales demonstrations. Enter “mars”. You can now navigate mars! Press the Earth icon to return to normal. Only appears in v8.0, subversion 2.50.114 and later (Dec-2016). “Ho Ho Ho” – for the Santa Sleigh with music. “Ho Ho Ho Not Funny” – for a different song! Husband – I’ve lost my wife, she went shopping yesterday and has still not come home. Sergeant – What is her height ? Husband – I really never noticed. Husband – Not slim, not really fat. Sergeant – Color of eyes? Sergeant – Color of hair? Husband – Changes according to season. Sergeant – What was she wearing? Husband – Dress/suit/ I don’t remember exactly. Sergeant – Did she go in a car? Sergeant – What kind of car was it? Husband – Arrest-Me Red Tesla Model S rear wheel drive electric vehicle with liquid-cooled powertrain with 100 kWh microprocessor controlled, lithium-ion battery, dual motors, drive inverter, and gear box, three phase, four pole AC induction motor with copper rotor, drive inverter with variable frequency drive and regenerative braking system and single speed fixed gear with 9.73:1 reduction ratio and has a very thin scratch on the right front door.… at this point the husband started crying. Sergeant – don’t worry sir…….We will find your car. The Team Members Easter egg doesn’t work on my Model S 60 refresh. I’m thinking it doesn’t work on newer cars. Invoking the Driving Rainbows easter egg (aka the “Cow Bell”) requires pulling the lever quickly. Thanks. You’re likely right. I just confirmed it still works on my 2013 S, but I couldn’t get it to work in the showroom on a 2016 S a few weeks ago. You do have to hold on the logo for 15 seconds or so or nothing happens. I’ll update the notes. how can i get a copy of the factory sticker price with options ? I’m not sure it’s possible, but I suggest contacting Tesla either the store where you bought the car, or use the Contact Us page on the Tesla Motors website. TeslaTap is not part of Tesla Motors.